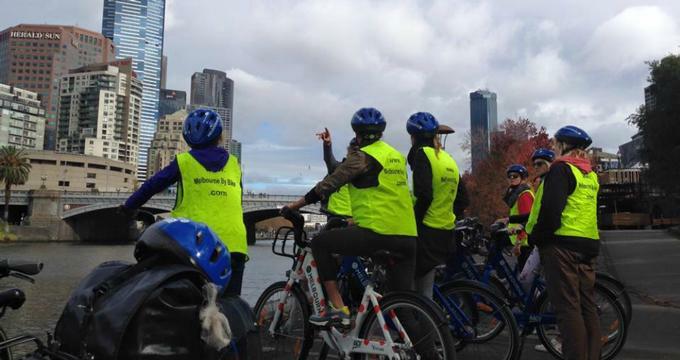 Melbourne by Bike allows locals and visitors alike to experience Melbourne via bike tours. Each bike tour is guided by an informative, friendly tour guide who offers their own recollection of the various landmarks and scenes of Melbourne. Because of this personalized touring experience, no two bike tours are same. Bike tour participants can choose from several bike tour starting points for a unique Melbourne bike tour experience. Melbourne by Bike allows people to learn more about the city of Melbourne while navigating on a bike. One of the main purposes of the bike tour is to engage people in the exploration of Melbourne. All tours are guided by friendly, informative guides, who are clearly visible in bright green vests. What makes the Melbourne by Bike tours unique is that no two bike tours are the same. Each bike tour guide has their own special way of touring Melbourne. This creates a unique one-of-a kind touring experience for all participants. City (Federation Square) - This is the most easily accessible tour starting location and route as it travels through the main part of the city. The terrain is flat and easily manageable for most bike riders. St Kilda - This start location is preferable for those that are seeking a day event after coming off a cruise ship. This tour is more suburban, with the beach as a beautiful touring backdrop. The terrain is flat and easily manageable for most bike riders. Shore Excursion - This tour is for those that want to enjoy the beaches of Melbourne. While riders will enjoy beach scenery, they will not see much of the city, although the tour can be changed to ride towards the city or ride further towards the beach. This bike tour is recommended during warmer weather. For each of these private tour options, those interested are urged to state their specific tour requests. The tours can be fashioned after the traditionally offered Melbourne bike tours, or the itinerary can be changed to suit the tour preferences of the tour participants. Melbourne by Bike operates a local charity event known as Bicycles for Humanity, which provides bicycles to less fortunate populations to increase mobility. Those interested in assisting with this good cause can register to complete a 110km while raising $110 in sponsorship. As of today, over 50,000 bikes have been sent to countries throughout Africa and other parts of the world. Because this is volunteer based, all the funds for Bicycles for Humanity go towards the charity. Those interested in contributing to this philanthropic effort can do so on an individual basis or as a team. Teams consist of 10 riders. In order to qualify for individual or team sponsorship, the initial sponsorship goal of $110 for individuals or $1100 for teams must be met.